My empties box has been full for quite some time now, I have actually been throwing out the duplicate things we have have used. I decided to finally do this this week because we are starting home school next week and I am trying to organize and clean a few last minute things. Did I like it: YES. Strong hold, doesn't leave hair sticky, I can brush it at the end of the day and the hairspray is gone. Both me and my hubby use it and love it. Will I repurchase? Yes, already repurchased. Did I like it: I bought this on Birchbox after loving the sample. I really love the smell and how it helps smooth my hair out before I blow dry. Did I like it: My hair is very thin and fine and I am always trying to find something to help thicken it when I style it. I was excited to try this, however I did not like it. In fact I barely noticed a difference. It gave me a slight "dirty" texture, but that is all. Did I like it: Yes! 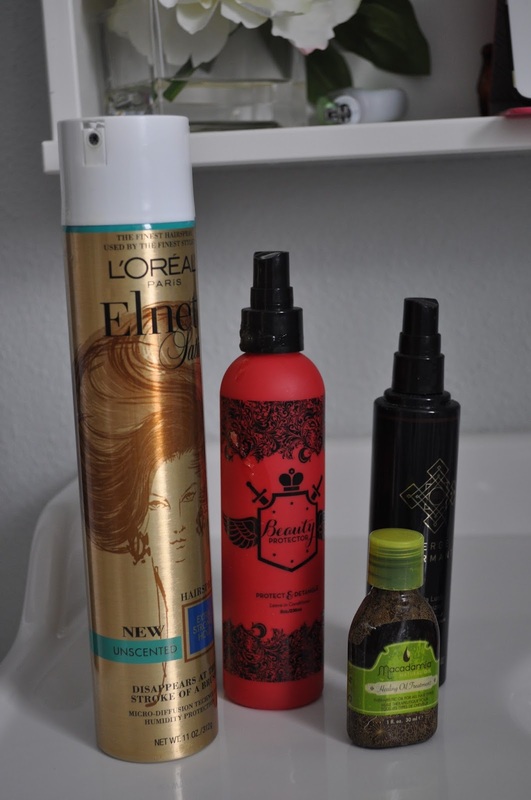 At first I used this after I dried my hair when I styled it to whisp away any frizzes. Then one day, my ends felt very dry and damaged. I took a handful of this oil and rubbed it into my ends and left it in my hair for about 4 hours. After I washed my hair, and my hair felt amazing. It was completely healed. I now have smooth hair that does not feel or look dry or damaged. Now I occasionally apply to ends before I blow dry. Something everyone should have on hand. Will I repurchase? Yes, I bought a larger size this time. Did I like it: YES! I wash my hair every other day. So I love to use a minty shampoo to gives me that deep clean feeling. I love that it is paraben, sulfate free too! Did I like it: Yep! My hair felt soft and easy to comb after. Did I like it: No. Because I loved the leave in conditioner, I thought I would love the shampoo and conditioner too, but I was wrong. The only thing I liked was the smell. The shampoo did a terrible job of cleaning my hair. I would have to shampoo at least twice to get even a slightly clean feeling. The conditioner didn't do a really good job moisturizing my hair either. I didn't even finish these two, my husband did. He said he liked them a lot, maybe it was to do with my hair being long and his hair being short. Did I like it: NO. I have tried a few of Its a 10 products and really do not see what the hype is about. I feel that there are so many better products out there. I didn't feel that this shampoo cleaned my hair well at all and I didn't care much for the scent. Did I like it: NO Again, I don't see what the hype is about. Nothing special about this hair conditioner. Just alright. Did I like it: Yes. I have always liked burtsbees shampoo and wash. I actually buy these in three packs and have used up 6 bottles all together. When you wash 3 kids every day, you go through a lot of shampoo and body wash. My kids haven't had any reactions to this and I like how they smell, even the unscented one. Did I like it: Kinda. This shampoo is OK, I probably won't buy it again, but there wasn't anything wrong with it. It did dry out my daughter hair, so a conditioner was a must after it. Did I like it: NO. I hated the smell! I am all for good smelling bath products, but this was way to much. Even my daughter would scrunch up her nose when I used it on her. As far as detangling, it did a good job getting her hair silky smooth, but I feel that there are so many other conditioners out there that would do that without that strong scent. Did I like it? YES! I wouldn't call it a foaming wash, since it barely bubbles up. But I love how great it works and that it does not dry up my skin. Will I repurchase? Yes, I already did. Did I like it? Kinda. This wash made my skin very clean but also a little dry feeling. It also foamed up a lot, which meant it would get into my nose and eyes. Did I like it? I leave this in the shower and use with my clarisonic on my face. I usually buy the nuetrogena one, but decided to try the Target brand. I didn't see any difference, works well to deep clean my face in the evening. Did I like it? Yes! I love bioderma makeup remover. Especially it I am wearing waterproof makeup. Wish I could pick it up in a store instead of online. ** Does anyone know if any store carries it? Did I like it? YES. I buy this nail polish remover all the time. It is a huge bottle which means it lasts a long time and it does a great job removing my nail polish. Will I repurchase? YES, already did. Did I like it? YES! I love that I can apply this after a shower daily to get a slight tan, the more often I apply it the better. It does streak if you don't apply it very well and it has a slight self tanner smell. Will I repurchase? Yes, Already have. Did I like it? YES. I use this before bed and have noticed a big different in my fine lines. When I ran out, I saw how dry my face was without it. I bought some right away and am happy again. It is spendy, but well worth it. Did I like it? YES. I adore this stuff. Most days I don't even use a moisturizer because I use this stuff. Diminishes fine lines, moisturizes, smoothes face texture, not greasy, dries quickly. It is spend, but one pump covers your entire face. Did I like it? Yes. I liked this treatment. On some days it seemed to work better then others. Did I like it? Yes. This is a inexpensive eye cream that moisturizes your eye area. Its nothing really special, but it did what it claims and didn't irritate my eyes, which is a plus. Did I like it? Kinda, some days it worked, some days it didn't, I think there are other spot treatments out there that do a better job. Well, that wraps up all the empties. Have you used any of these products? if so did you like/unlike them?